What Shell Says - A Manchester Beauty, Fashion and Lifestyle Blogger: A Lucky January! Hope you're all having a fabulous Friday! I'm soooooo glad it's the weekend, this week in work has dragged!! I've been a very lucky girl in January so far and have won a few competitions.....woohoo! So I thought I'd post about them here! I won some lovely Pamela Mann tights and ankle socks, a £15 iTunes voucher and a Burt's Bees pamper package! There are some really lovely goodies here...I feel very lucky and grateful! 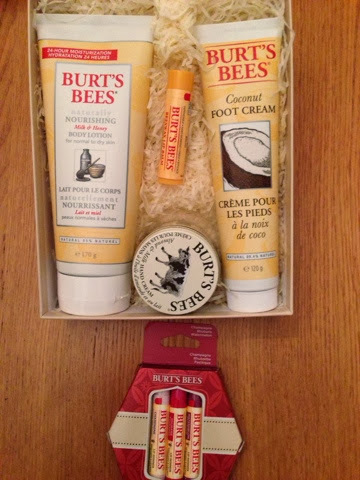 I've used Burt's Bees lip balm before but haven't used any of their body products so I'm looking forward to trying them and sharing my thoughts with you guys on here! Have you tried them before? I'm treating myself to a lovely pedicure tomorrow morning - my size 4's haven't had any TLC in a while so hopefully they'll be all pretty again tomorrow! Haha! Can't wait, I love being pampered! Unsure whether to go for coloured polish or french.......hmmm decisions, decisions! What are your plans for this weekend? Hope you have a good one!